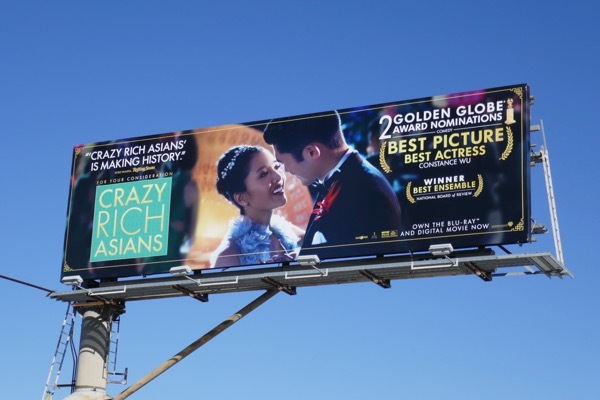 The Oscars So White controversy in 2015 highlighted the lack of ethnical diversity and opportunities in Hollywood, not only for black actors, writers and filmmakers, but also for Latino and Asian talent. Earlier this year Black Panther showed that there was a real appetite for a big blockbuster offering fronted by an almost all-black cast and became the third movie to ever pass the $700 million domestic box office, already having surpassed $1 billion in ticket sales globally. 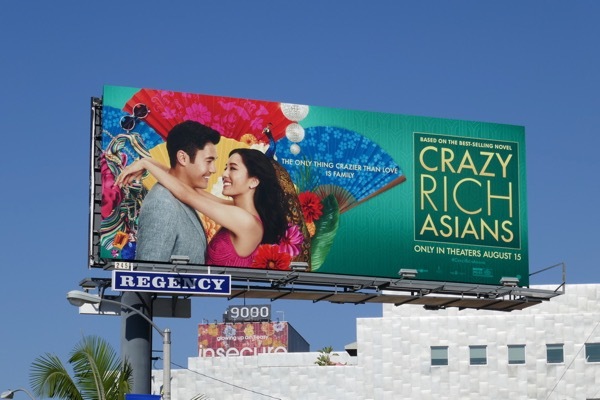 This summer the romantic comedy Crazy Rich Asians may not be shooting for billion dollar success, but it is the second only movie with an all-Asian cast to hit mainstream American cinemas since Joy Luck Club in 1993. 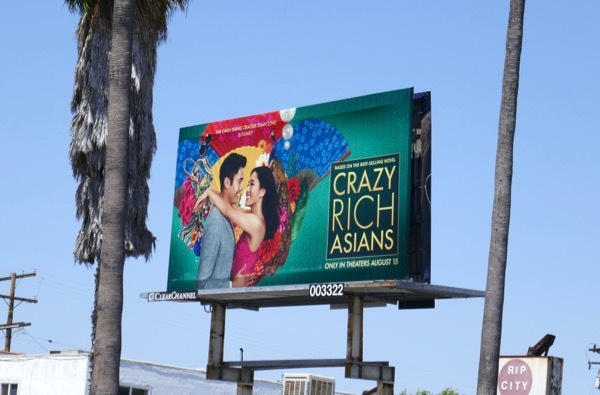 Constance Wu stars as 'Rachel Chu' in this adaptation of Kevin Kwan's 2013 novel of the same name, who accompanies her longtime boyfriend 'Nick Young' (played by Henry Golding) to a friend's wedding in Singapore and is thrust into a world of the uber-rich and famous when she discovers his family is one of the wealthiest in Asia. 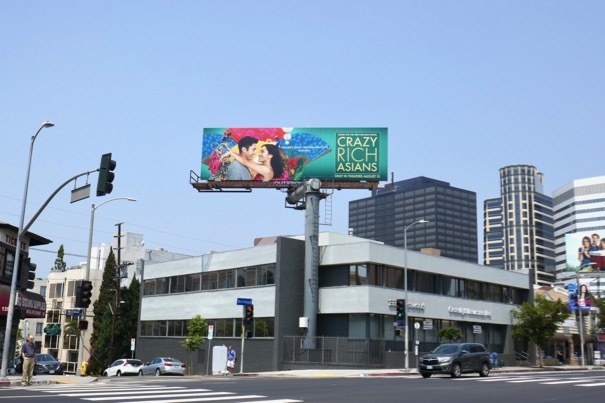 These colourful movie billboards were photographed along Westwood Boulevard, the Sunset Strip, Santa Monica Boulevard, Fairfax Avenue and La Cienega Boulevard from July 28 to August 5, 2018. 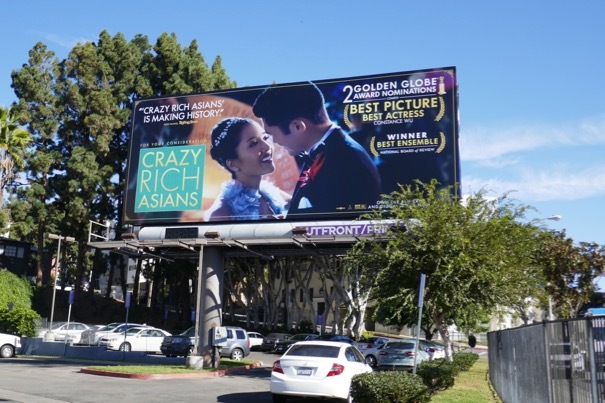 Fans of Constance Wu can also check out these Fresh Off the Boat TV series billboards from 2015. 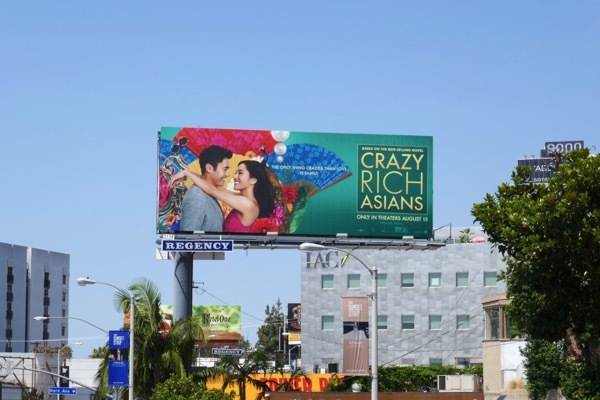 Let's hope the visibility of Crazy Rich Asians leads to the start of many rich, diverse and unique stories from Asian creators in Hollywoodland in the future. 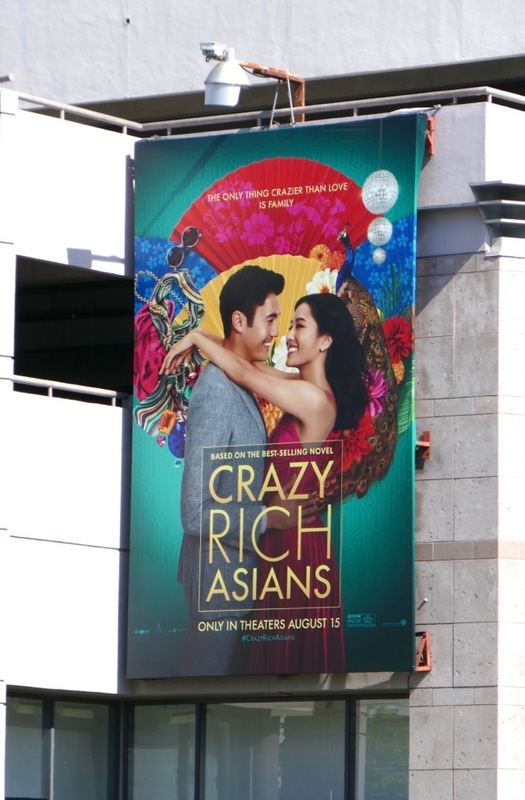 UPDATED: Fans of the movie can also check out these screen-worn Crazy Rich Asians costumes on display. 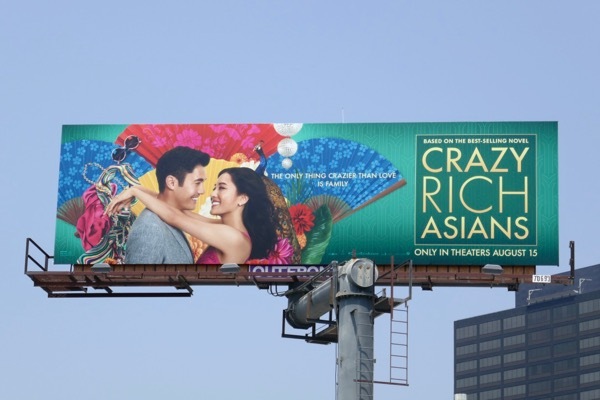 UPDATED: Crazy Rich Asians scored big at the box office with over $238 million in global ticket sales, but can the movie repeat this success with accolades this winter Hollywood awards season. 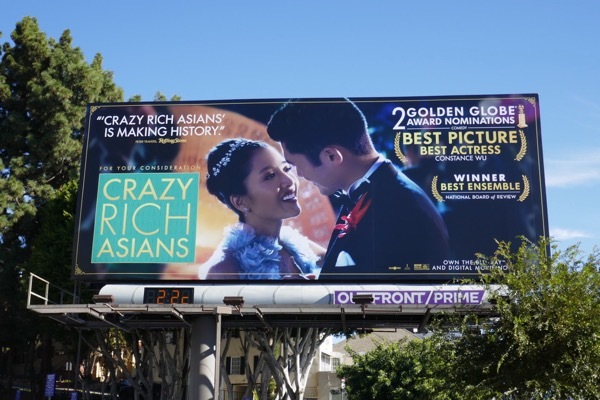 This Golden Globe nominee billboard, for Best Motion Picture - Musical or Comedy and for Constance Wu for Best Actress, was spotted along the Sunset Strip on December 19, 2018. 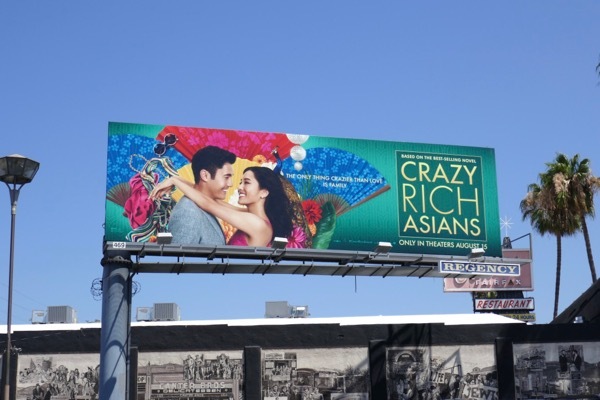 Plus here's another nominee billboard example snapped along Pico Boulevard on December 28, 2018.